On July the 7th 2016 at 17h45 in Aalst (Belgium) a Eucharistic host spontaneously started colouring blood red. The phenomenon occurred in the home of Father Eric Jacqmin, in the presence of several witnesses. The bleeding host in Aalst sits enclosed in a tin monstrance measuring 30 cm in height. But the monstrance cannot be opened, as is customary with all host- or relic ostensoria. The back side of the round holder in the middle is sealed by soldering. On the front side sits a flat glass plate locked in place by the ring of the holder. Without breaking the object, access to the host is impossible. Therefore any improper manipulation of the host is ruled out. The backside of the holder is completely soldered tight. The picture of the front side shows the glass plate fixed beneath the ring of the holder. Without breaking the glass, access to the host is out of the question. Front view of the holder showing the flat glass plate. Father Jacqmin had been given the liturgical art object some 9 months earlier (about October the 7th 2015) by a fellow believer who had owned the object for 23 years. Neither the Reverend nor the believers knew that the object was indeed a real host. 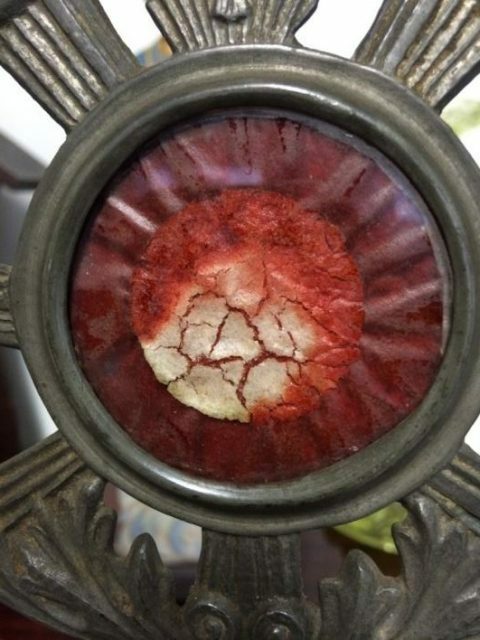 Father J. thought it to be a white paper or cardboard imitation of the small wafer (given to the faithful participating in the Eucharist) full of cracks resulting from dehydration and age ( as can be seen in the images, the part of the host that remained white still shows the cracks). It thus concerns a small wafer of hardly three centimeters diameter, hence not the host of the priest used during Holy Mass, for example at the consecration and the raising of the host. The former owners had cared for the monstrance for 23 years leaving it on the mantelpiece in the sitting room without its host showing any change whatsoever. They put their house at the disposal of the Reverend on the 15th of August 2015. From that day on-wards the monstrance stood in their new house until the 7th of October 2015 when it was given to the Reverend in honour of the feast of Our Lady of the Rosary. Since neither the Reverend nor someone else could have suspected that it could involve a real host, he had put it on a nice sideboard next to other religious statuettes. 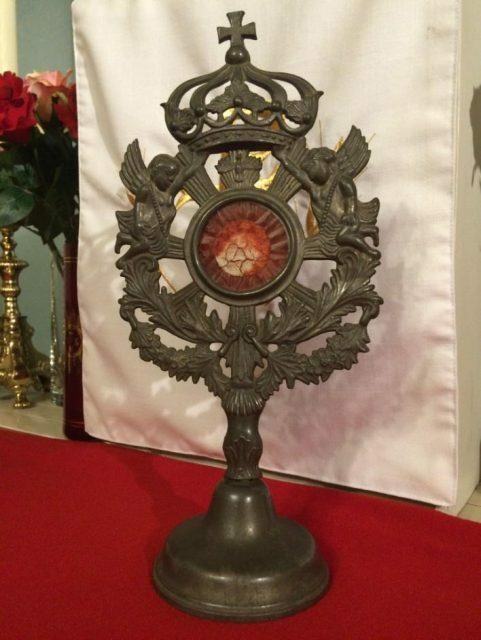 According to the antiques dealer in Aalst (Ars Sacra), from whom the object had originally been acquired and who is a director in a chemical company by profession, the monstrance dates back some 200 years. Its style, material and composition are clear indications of this. Moreover, he remembers the purchase and the selling of it. He bought it in Nijvel (Belgium) from a local antiquary who himself had obtained it from a nunnery that had been closed and sold out. It probably concerns the Conceptionist nuns who left Nijvel in 1974 after ” a painful selling off of the convent” thus tell the archives of the library in Nijvel ; at present some of the aged sisters are still alive and living in Bastogne: Soeurs Conceptionistes en Belgique. Finally the man told us he did not understand the phenomenon, that he had bought and sold the monstrance with an imitation of a small, white wafer in it and that he had no idea (as director of a chemical company) how this could have occurred. Sudden and unexpected transformation into a bloodred colouring host in Aalst (Belgium). Anyhow, according to the antiquary, the host has been enclosed in the monstrance for 200 years. In all that time it hasn’t perished but at first sight it has become unrecognizable to the naked eye. Over time a network of cracks has appeared in it and through dehydration the bread of the host looks a bit “crystallized or fossilized”. However in the part of the wafer that has turned red, the cracks have largely disappeared. The host has been placed on the background of a purple paper. This paper has probably been applied so as to fill the void around the host. The spokesman of the diocese of Ghent, Peter Malfliet, declared to the press that “Eucharistic miracles belong to the middle ages.” To that we answer with a question from the Mechelen catechism: Question 123. “Is the truth of the roman-catholic church confirmed by miracles?” “Yes, since its founding and through all ages, the truth of the roman-catholic church is also being confirmed by miracles.” Catechisms pass on the infallible Teaching, by the Ordinary Universal Magisterium of the Church. The Reverend showed it to his then bishop, Mgr. Sanborn, who thought it to be “a remarkable phenomenon you should have examined by experts.” “I will, Monsignor”. “there is a 100% scientific certainty that bacterial or fungal activity is in no way involved”. “Bacterial or fungal activity cannot occur in a few minutes time and it doesn’t stop as long as there are nutrients present.” and “neither is a chemical reaction possible, because no new catalysts have been inserted”. Indeed, the monstrance had been permanently kept in the Reverend’s living room where it had always been, under identical circumstances: in the same house in the same place where it had been standing for 23 years, because as said before father Jacqmin had moved into the house belonging to the former owners of the monstrance. Furthermore all of the five witnesses have signed a complete and clear declaration. As a result, according to all experts, apart from bacterial or fungal activity or some chemical reaction, there is no scientific explanation possible. As these causes are excluded one is forced to conclude it involves Divine intervention. because light cannot be passed through the monstrance and the host. Therefore transmitted light microscopy isn’t possible. 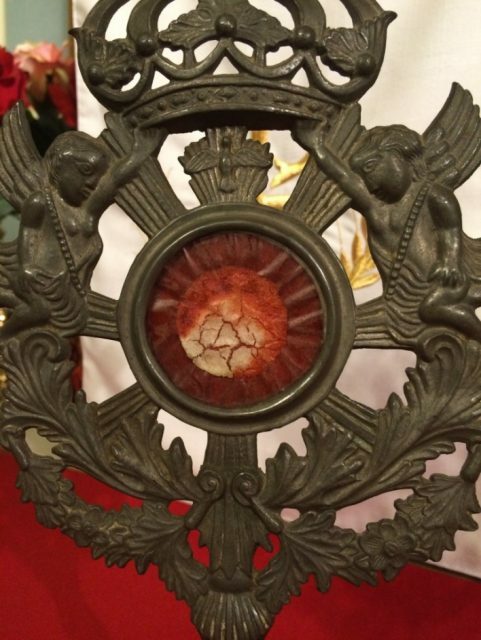 It is impossible put a sample of the white and red substance on a cover slip so light could be passed through it because the monstrance cannot be opened. Therefore one has to resort to using microscopes that allow the object to be lighted from above and the functions of these instruments are limited. 2. To start with, he made images of 40x and 100x magnification. 3. 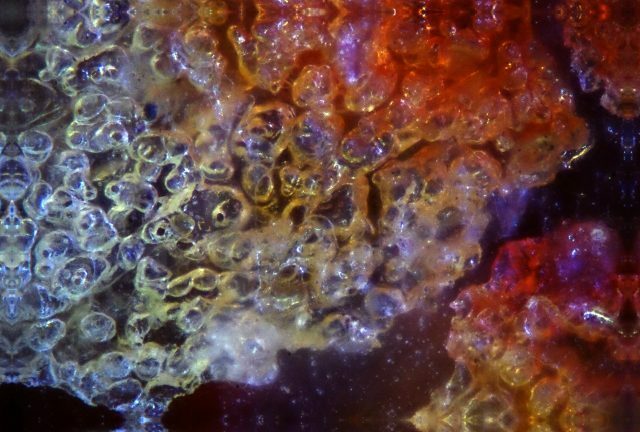 The microscopically enlarged “white part” shows tiny air bubbles as is the case with wheat bread resulting from the action of the yeast. (starch bullets of wheat). 4. Picture 1 clearly shows these bullets in the white and red parts. Picture 1: magnification 100x. Shows a dividing line between the white and the red part. The white part contains bubbles like wheat bubbles. 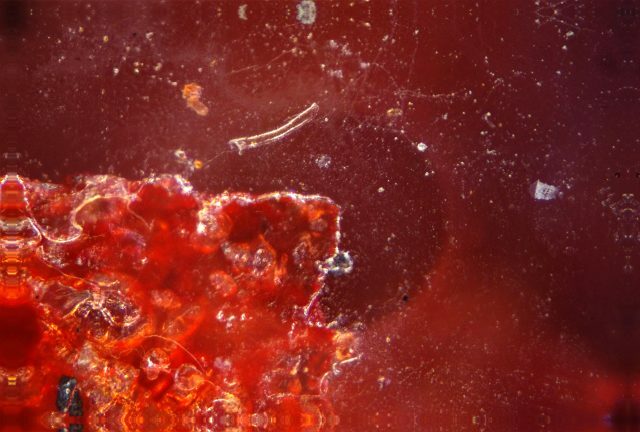 The red part reveals freshly red coloured bubbles with on the right and upper right a blood-red plasm-like, sticky mass on it. One clearly sees the crack running from the bottom left to the upper right, with the purple paper on the background. 5. Picture 2:two of the bubbles have been encircled red. It truly is wheat bread. Picture 2: red lines highlight the wheat bubbles and the dividing line with the red liquid on the surface of the bread. 6. One sees the borderline between the white and red parts which is where the red liquid starts coming to the surface. See the red borderline in image 2. 7. The “red colouring” is actually caused by some kind of liquid because it shows an irregular and continuous separation line with the non red part. 8. There is no mention of fungi whatsoever because nowhere fungal filaments are to be seen. 9. The red colouring substance isn’t water because in that case the bread (the bubbles) would have been affected or would have decayed. 10. The red part looks very fresh as if still liquid or viscous, so it hasn’t coagulated. This needs to be followed up with still more powerful microscopes. 11. Image 3 shows the borderline between the red part of the host (lower left) and the purple paper around the wafer (top and right). There is a marked difference in colour and structure. The differences are too big: the red color is strong and fresh the purple is dull and dreary, so the bright red color cannot have been caused by the diffusion of the duller purple colour of the paper due to some liquid. Picture 3: the dividing line between the host and the purple paper surrounding it. 10. The red colouring substance appears to be a thick or viscous liquid. It indeed has the colour and appearance of fresh blood. 11. It is remarkable that after 1.5 years “the bloodred substance” looks that fresh and is not coagulated. round about the hour Jesus consecrated the first hosts (wheat bread in the first Mass on Maundy Thursday during the Last Supper). 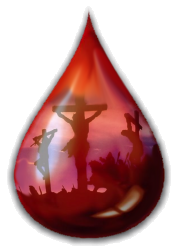 and July has been consecrated by the Church to the Most Precious Blood of Christ. In July we remember that “Jesus shed his blood”: He gave his life for us in martyrdom. 3) It takes place on Father Jacqmin’s birthday, the 7th of July and nine months after the monstrance had been donated to the Reverend on the 7th of October (the feast of Our Lady). So, after having been given the monstrance nine months before on the feast of the Mother of God, Jesus becomes visible. After nine months it become evident that the host was once consecrated and thus the body of Jesus… the Child of the Mother becomes visible. all of whom knew the object as it had been before. 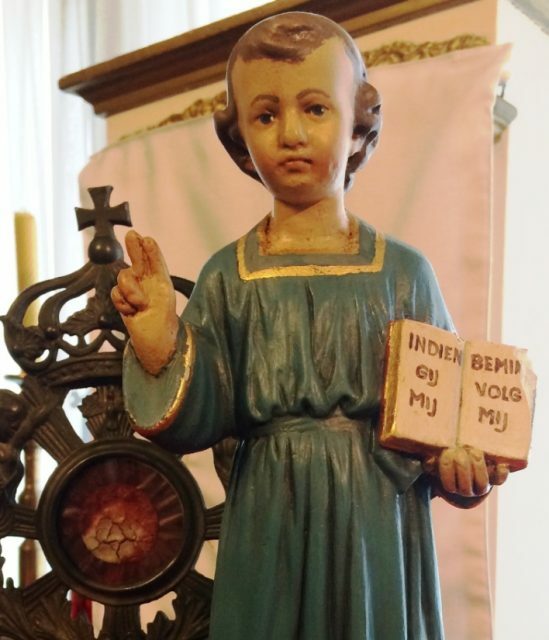 as a present to the Reverend who had placed it on a sideboard next to the monstrance (see below): The statuette of Jesus carries a text from the Gospel :“If you love Me follow Me.” See image below. 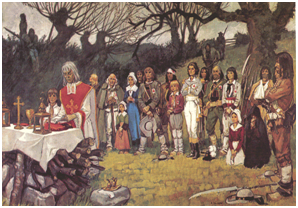 1798, the last time the faithful of these regions shed their own blood for their belief and family. Their maxim was “voor outer en heerd” (for altar and hearth). The man who started the Peasants War was Charles Loupoigne Jacqmin, an officer in the Austrian army, who appointed the main Flemish leaders: Van Gansen, Rolliers etc. He incidentally carries the same surname as Father Jacqmin. Charles Jacqmin stayed in Nijvel on several occasions and twice he went into hiding in Aalst… all coincidence!? Furthermore, before the occurrence the Reverend had placed a small, beautiful cabinet in his chapel next to the altar, with inside it little earthenware pots containing some soil from the locations where the main losses of the Peasants War have been suffered. This soil has been sanctified by their blood, shed for “altar and hearth”, for religion and family. 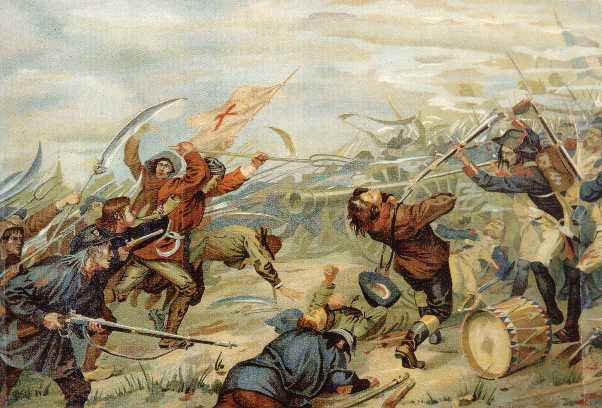 The Reverend did so in order to be able to better revere the unknown Holy martyrs of the Peasants War. About a 1000 of them died in Mol, 1000 in Wintham, 650 in Ter Hilst near Hasselt etc. He has also a flag of the Peasants War on display in the same chapel: a blood red cross! Again a coincidence? 7) For people keen on biblical number symbolism: the date and the holy number 7. The phenomenon happens on the 7th of July 2016 or 7-7-16. -for 7 is the connection between 4 and 3 as 4 + 3 = 7. -4 is the number of the universe, of creation symbolized by the 4 points on the compass (location), the 4 elements (composition: water, earth, air and fire) and the 4 seasons (time). -3 is the number par excellence of the True God who is Threefold. -Religion or faith is the relation, the connection, the coming together of God (=3) and creation (=4), religion is the meeting of the Creator Himself (3) and the King or Representative of creation (=4) and therefor religion is 3 and 4 coming together to form 7 for 4 + 3 = 7. 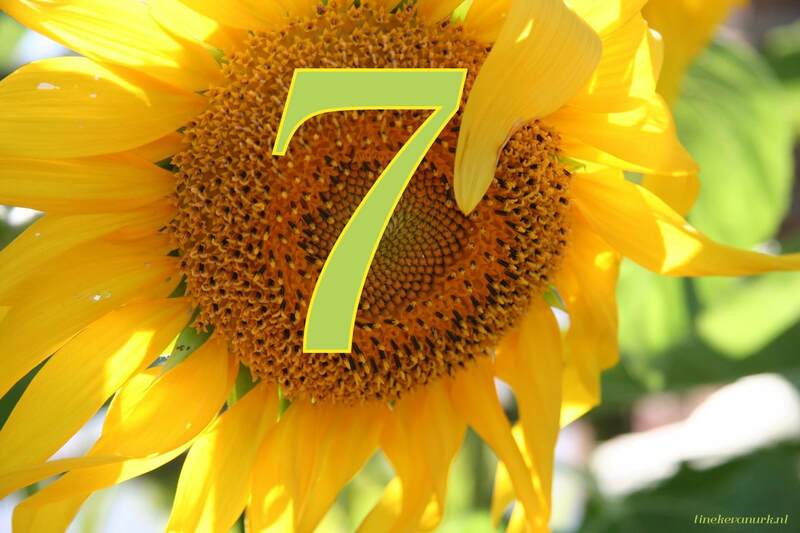 “7” thus is the number of religion. When on the seventh day God had completed the work He had been doing, He rested on the seventh day after all the work He had been doing. Genesis 2-2. -A second reason why 7 is the number of religion: the seventh day was the end of the week of creation and became the “day of sanctification”. Because on the 6th day God completed his creation by creating man and on the 7th day He rested. So “6” is the symbol of the perfection of creation: man is king of the visible creation. But man (“6”) needs to become “7” in this sense: something must be added (“1” added, namely “honoring God”), he must acknowledge and praise God. So, on the seventh day he must “practice religion”, keeping the Lord’s Day holy. If “6” refuses to become “7”, if man refuses to honor God, if he refuses to become religious, he grows bad. If on top of that he turns himself into God, it becomes “666”, namely man (=6) who arrogates to himself the divine number 3, three sixes, “666” is the symbol of the antichrist, according to the Apocalypse: the ungodly man with a vengeance. In short “7” is “6 who acknowledges and honors God” and thus becomes “7”. 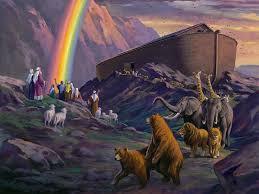 – Thirdly : the biblical sign of God’s reconciliation with humanity after the fall of man is the rainbow which consists of seven colours. The rainbow appears in 7 colors. -Fourthly. In the Catholic faith there are 7 sacraments, 7 Gifts of the Holy Spirit, 7 infused virtues, (3 of which are divine and 4 are moral virtues), 7 works of mercy. 7 is a holy number. In short “7” is the symbol of religion and thus also of the priest who must organize and practice religion, who must reconcile “3” with “4” by practicing religion and must convert “4” to “3”. 3) in the house and on the birthday of a priest. “Priest” is religious = “7”. So three sevens: 7-7-7. This is the date of the event. Coincidence again? -Fr Jacqmin’s birthday is the 7th of July 1952, or 7-7-’52. So once more 7 – 7 – 7, obviously a fitting date for a priest to be born on. Moreover, he has been born exactly nine months after the 7th of October (above-mentioned: on the same date he has been given the monstrance. Once again a coincidence? His first appointment as a priest was to the diocese of Den Bosch, whose patronage feast is “the Sweet Lady of Den Bosch”, celebrated on the 7th of July! Coincidence again? His first chapel he was responsible for had been consecrated to “Our Lady of the Rosary” whose feast is celebrated on the 7th of October. (mentioned above: same date he receives the monstrance). Coincidence? His second appointment, after a breathing spell, is Eastern Europe (Poland, Lithuania, Latvia, Russia). The Heavenly Protectors or Patron Saints of Eastern Europe are the Saints Cyrillus and Methodius, whose feast day is celebrated on the 7th of July. Again coincidence? His third appointment is Flanders (Antwerp) where he devotes himself in particular to the Flemish Catholic Movement and more specifically to the Pilgrimage of the Yser and the Yser Vigil; which he has consecrated, by the chairman, to the Holy Virgin Mary. The foundations of the Yser Tower (the birth) were laid in 1928, blessed and celebrated on the 7th of July. Coincidence once more? That the host begins to bleed on that day is, to the Reverend, a very “loaded” date. All coincidence? 8) How it happened that 7th July 2016:. On the occasion of Father Jacqmin’s birthday on the 7 – 7 – ’16 seven people had been invited at his home to attend Holy Mass followed by a small birthday party and a meal. At noon after Holy Mass Father Jacqmin opens the presents and one of the packets contains a figurine of Jesus as a juvenile. The Reverend exclaims: “Fine, that is an image of Jesus as he was 2000 years ago. 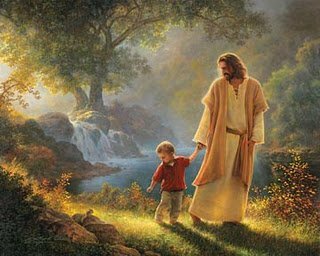 Since it is now 2016, it’s 2000 years past that Jesus was 16 years old”. And he places the figurine next to the monstrance on a sideboard in the dining room. This gesture incidentally draws the attention to the monstrance so everyone can see the host is still completely white, that it still is, as it had been over so many years, and has undergone no change. Later in the day, at 17u30 the Reverend takes three of the guests to the station. In the meantime, at 17h45, the 4 remaining guests look once more at the figurine on the sideboard, in order to read the text inscribed on it. At this occasion they remark at once that the host is partially turning blood red: the red color progresses in reversed moon shape from left to right. Furthermore Father Jacqmin arrives at 18 hours and sees the last part turning red. He is the fifth eyewitness. In the blood red part the cracks have disappeared and the host has become whole as if “healed”. This may indicate the presence of blood which indeed has a coagulating action. A year later once more a “coincidence” with the date. In august 2017 Father Jacqmin goes just around the corner from where he lives to a wine merchant, Le Compte in Aalst, to buy some sacramental wine. He asks the lady shopkeeper for white wine, as pure as possible, without additives. 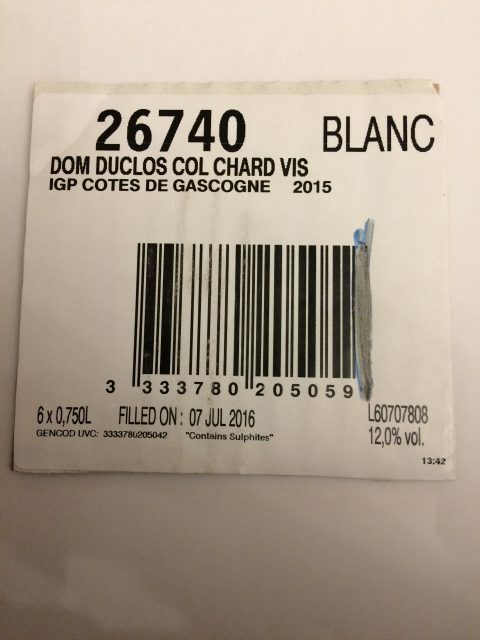 She advises him to take “Dominique Duclos (à Vis) IGP des Côtes de Gascogne Colombard Chardonnay 75 cl.”, containing few sulfites. The Reverend agrees and he buys a lot of boxes so as to profit from the price reduction, he is given a free corkscrew, pays, loads everything and leaves. At home he unloads the boxes and…by accident reads what is printed on it: “filled on 07 JUL 2016”. Yes, the date at which the host began to bleed the year before. 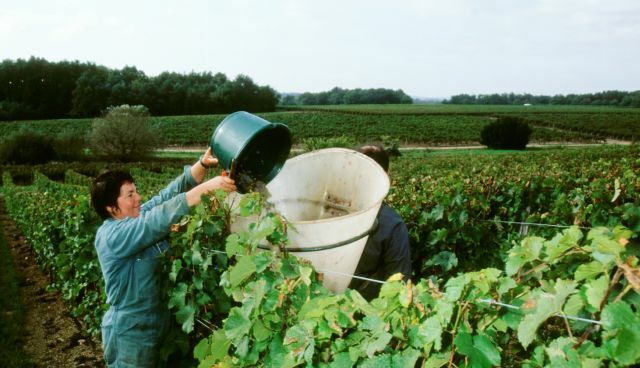 The wine that during the Holy Masses will turn into the Holy Blood of Jesus, has been poured into bottles on the same day the Host in the monstrance began to show a red color. Coincidence? Saint Thomas says: too much coincidence is no coincidence. Piece of cardboard cut from the carton containing the wine bottles. 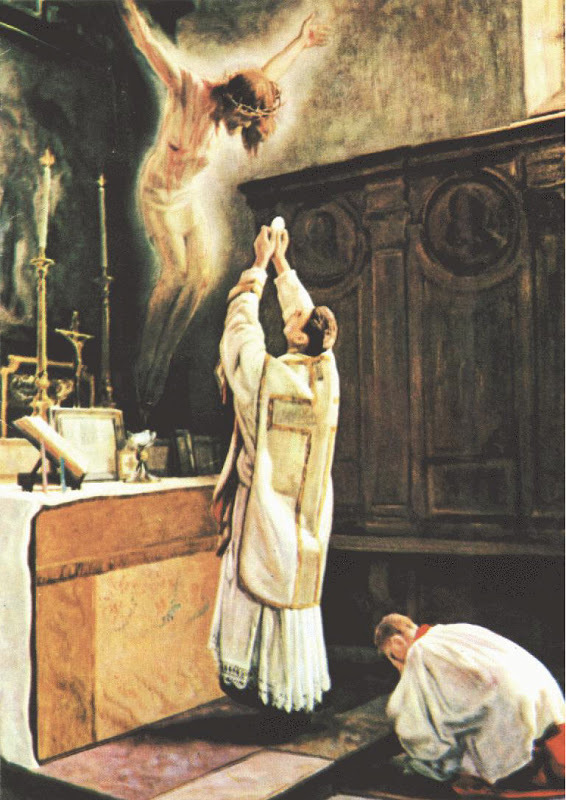 that – in reverse – for unbelievers and doubters there is being referred to the fact that during the consecration the priest turns (the substance of) the bread of the host into (the substance of) the Body of Jesus. This is called the dogma of the transubstantiation: the physical and sensory perceptible attributes of the bread and the wine remain but by the power divinely bestowed upon the priest at the ordination, he annihilates the substance of the bread and the wine and substitutes it for the Body and Blood of Jesus as he is now, seated at the right hand of God the Father Almighty. 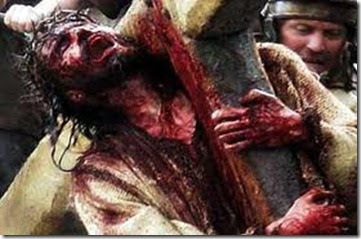 When Jesus said:” This IS my body and this IS my blood” it did turn into his body and blood (the essence, the substance, its “being” has changed), even though we keep SEEING bread and wine: the sensorial perceptible properties have remained the same. At the consecration of the Mass, Jesus becomes invisibly present: here made visible in a painting by Paul Wante. Answer: The devil, as a fallen angel, knows and can do what every other angel can, because at his fall from grace he didn’t lose his angelic nature (extraordinary intelligence and powerful will, compared to humans), but he did lose his “state of grace”; he knows and indeed can do more than humans know and can. He certainly knows more (all!) natural laws and is better at manipulating them. However, according to the saints there are two things the devil CANNOT do: that is encouraging love to God and humility. Because that is radically opposed to what he favors. 1. “if you love Me, follow me…”: is really inspiring love. 2. “…follow me” is an exhortation to obedience and thus to humility. St Ignace indeed says that the first step of humility is obedience to God, meaning obedience to His Commandments, to the lawful commands of legitimate superiors in the willing acceptance of all vagaries in all the circumstances of life. Likewise Jesus was followed by but a few – in the end perhaps 10.000 Jews (out of the 2 million) converted and had themselves baptized – and finally he was even killed by those who said, after he had raised Lazarus from the dead: “now we not only have to kill Jesus but Lazarus also”.. because Lazarus resurrected is the proof he is the Messiah. They did not want to believe. They even wanted to do away with the miracle. Then everything stops because at His incarnation the angels sang: “Peace on earth to all people of good will”, so not to people of bad will. That doesn’t alter that the Good follows its own course. Nobody stops God. Can we really speak of a miracle? 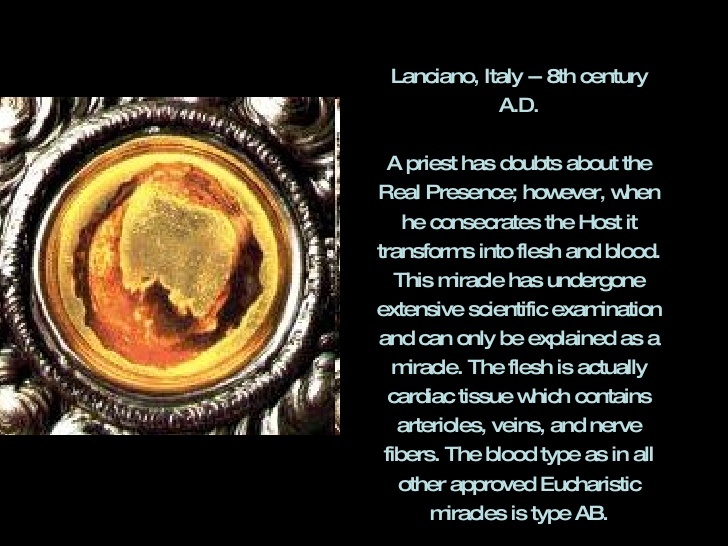 What is a miracle according to the Catholic Church? A miracle is a sensorially observable phenomenon for which a scientific explanation is neither available nor possible and which occurs in religious circumstances. To the believer and to every reasonable man it is an intervention by God Almighty, for the most part through angelic intervention, so as to ease the quest for the true religion. The Church has six characteristics: four internal and two external. -internal : She is one, holy, catholic and apostolic. -external : over all the ages prophecies and miracles happen in Her. The infallible dogmatic first Vatican Council has declared in 1870 that “anyone who claims miracles to be impossible is excommunicated”. 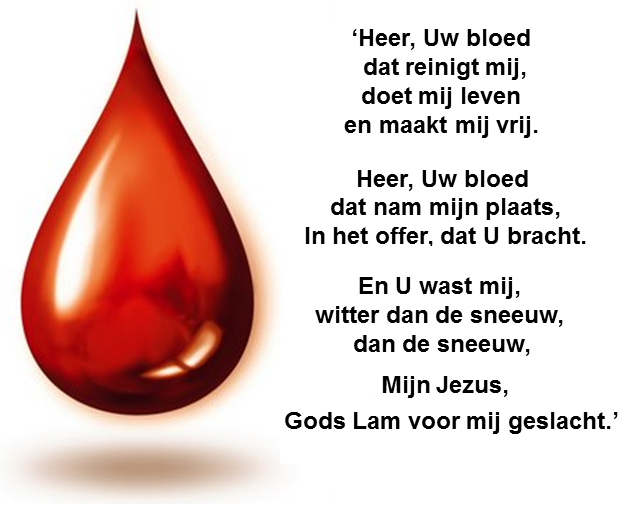 ‘Lord, Your blood that cleanses me, makes me live and makes me free. Let’s reflect on the meaning of this event. Father Jacqmin does indeed promulgate an extensive declaration on the Church, Her 50 year long crisis, the present popes and antipopes and the solutions to it. For this he exclusively draws upon two faith sources (Holy Scripture and the Tradition) based on proven facts. It is about certainties because doubting the sources of the Faith is heresy and doubting proven facts is madness. Reading more: see texts on this website. We observe that since the day of the bleeding, the 7th of July 2016, no aspect of the host has undergone any change whatsoever. Microscopic investigation, through the glass, has already been conducted so as to determine which is the substance involved: blood or something else. The result is that the red part does indeed look like blood. But to add weight to this examination specialists in microscopy are being contacted. We will keep you informed. How to explain an encased and sold host? In other words which priest will encase a small host intended for the faithful in a small tin monstrance and sell it afterwards? Isn’t that sacrilege? 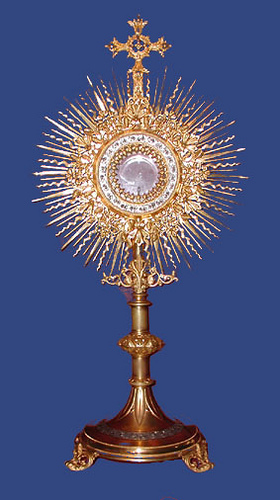 Normally a monstrance is much bigger, made of silver or gold and the host is removable. Anyhow a host is never encased an even less sold. The French Revolution ( Paris 1789) violently enters Belgium. The cities do not dare resist because most ramparts and fortifications have been pulled down by the heretical Sacristan Emperor Joseph II of Austria. With great effort we succeeded in chasing him away, but we hadn’t the time to repair and rebuild our defensive structures. 12th of October till 5th of December 1798: up to 15.000 death ‘for altar and hearth”. 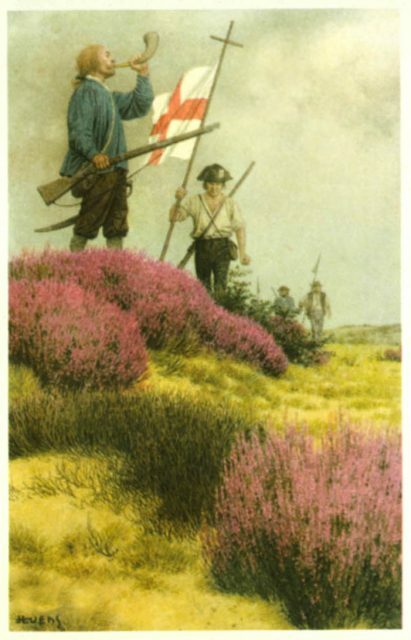 The only ones to offer resistance are the Flemish farmers, because religion is being prohibited and our lads are being drafted into the armies of the revolution in order to violently spread this fallacy all over Europe. Priests have to swear to a blasphemous text. Most of them refuse. Between Brussels and Luxembourg a small group of insurgents (the revolutionaries call them “Brigands”) led by Charlespoeng (Charles Jacqmin) is active. 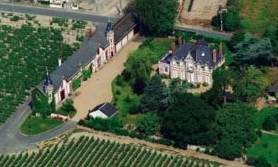 The conceptionist nunnery with his chaplain is located in Nijvel. Since the pursued insurgent or “Brigand” Charlespoeng is in the neighborhood, the persecution in this region becomes intense and dangerous. As is the case with many priests the chaplain of this monastery is forced to go into hiding so as not to be caught, killed or deported to French Guyana, the hell on earth. Before leaving he says goodbye to the sisters who complain that with the departure of the priest God too departs them in a certain sense: no more Holy Mass, no Communion, no Exposition of the Most Holy Sacrament, nor Worship, an empty Tabernacle, no Monstrance. The chaplain comes up with something to grant the sisters as much as possible the presence of God: the small monstrance he had recently made by an artist-believer, it is made of cheap materials because the Church in our land has been completely plundered by the “sans-culottes”, and it is small because that way he can, in his covert apostolate, easily take it with him and hide it. A normal golden or gold plated silvern monstrance for which, in those times of persecution, there was neither money nor place. He hasn’t got the time to quickly consecrate a large host in a Holy Mass. So rapidly and reverently he takes a small consecrated host out of the tabernacle and has it hermetically sealed in the monstrance by a believer craftsman so as to preserve the bread as long as possible. He fills the void behind the host with a purple paper because the monstrance had actually been made to accommodate a big Priest Host therefore the small host doesn’t cover the entire space. 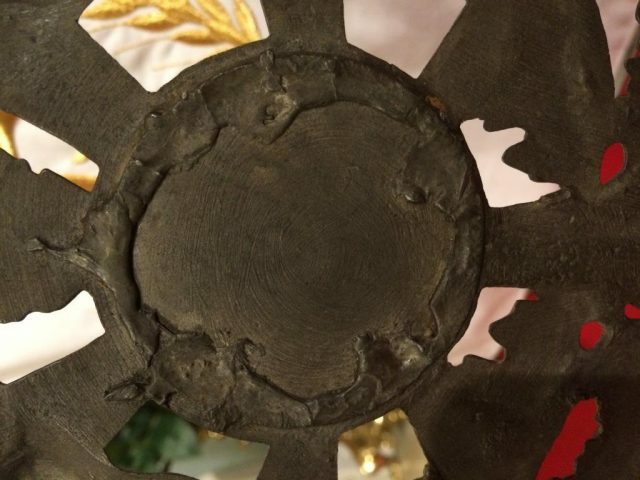 “the sisters have been persecuted and their convent closed, they went back to their families until years later peace had been established between the Church and the state.” Every time the monstrance was taken along or hidden because the host had perished (it had become unrecognizable as bread). the convent is being sold and no one knows any more what the monstrance, which had all that time been safely locked in the sacristy’s big vault or in a big cabinet, represents. After many wanderings it finally ends up with Father Jacqmin and God decides to let this priest and the faithful know it involves an old and once consecrated host. Taking into account all the little pieces of this church-historical puzzle, it is the only possible explanation I know off because in this manner all pieces neatly fit one another. Secret Mass in the woods by a priest in hiding. Should we worship or revere the host and how? In all probability it should be revered because, most likely, we have to do with the relic of 200 year old consecrated host (the white part) and the miraculous sign of or relic of Jesus’ Blood (red part) ; like the relic of Jesus’ Blood in Bruges is revered. It dates back to the last time part of our population shed its blood for the sake of the faith. Are we too, as we pray in the Act of Faith, willing to:”to live and to die in this true faith”? This entry was posted in Miracles and Prophecies by Julien Laurent. Bookmark the permalink.